Objective To determine whether treatment of isolated stable Weber B type ankle fractures with a cast or a simple orthotic device for three weeks produces non-inferior outcomes compared with conventional immobilisation in a cast for six weeks. 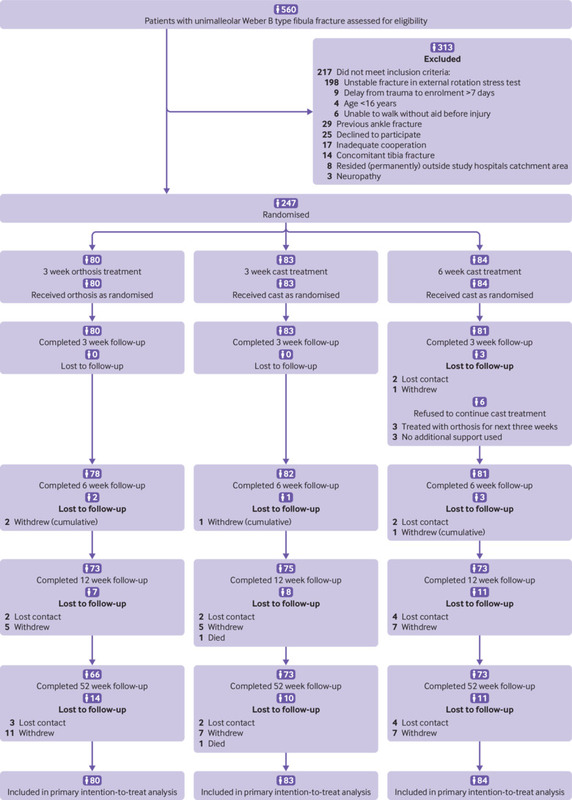 Design Randomised, pragmatic, non-inferiority, clinical trial with blinded outcome assessment. Setting Two major trauma centres in Finland, 22 December 2012 to 6 June 2016. 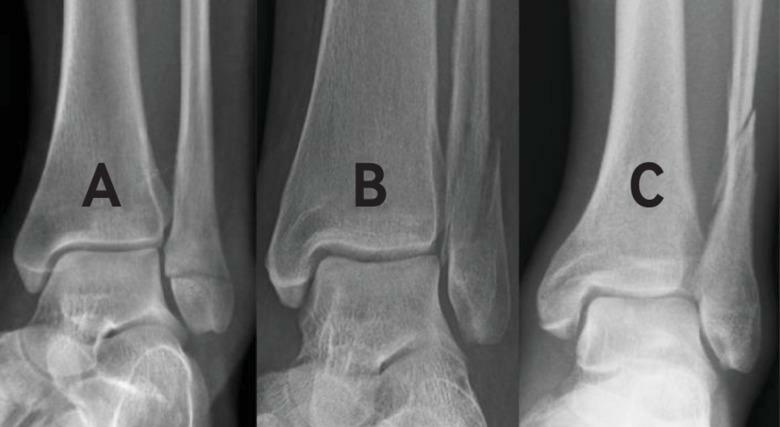 Participants 247 skeletally mature patients aged 16 years or older with an isolated Weber B type fibula fracture and congruent ankle mortise in static ankle radiographs. Interventions Participants were randomly allocated to conventional six week cast immobilisation (n=84) or three week treatment either in a cast (n=83) or in a simple orthosis (n=80). Main outcome measures The primary, non-inferiority, intention-to-treat outcome was the Olerud-Molander Ankle Score at 12 months (OMAS; range 0-100; higher scores indicate better outcomes and fewer symptoms). The predefined non-inferiority margin for the primary outcome was −8.8 points. Secondary outcomes were ankle function, pain, quality of life, ankle motion, and radiographic outcome. Follow-up assessments were performed at 6, 12, and 52 weeks. Results 212 of 247 randomised participants (86%) completed the study. At 52 weeks, the mean OMAS was 87.6 (SD 18.3) in the six week cast group, 91.7 (SD 12.9) in the three week cast group, and 89.8 (SD 18.4) in the three week orthosis group. The between group difference at 52 weeks for the three week cast versus six week cast was 3.6 points (95% confidence interval −1.9 to 9.1, P=0.20), and for the three week orthosis versus six week cast was 1.7 points (−4.0 to 7.3, P=0.56). In both comparisons, the confidence intervals did not include the predefined inferiority margin of −8.8 points. The only statistically significant between group differences observed in the secondary outcomes and harms in the two primary comparisons were slight improvement in ankle plantar flexion and incidence of deep vein thrombosis, both in the three week orthosis group versus six week cast group. Conclusion Immobilisation for three weeks with a cast or orthosis was non-inferior to conventional cast immobilisation for six weeks in the treatment of an isolated stable Weber B type fracture. Evidence from biomechanical studies suggests that an early mechanical stimulus is a critical factor in the healing of stable fractures, warranting further investigation of clinical response to shorter durations of immobilisation.313233 A few small patient series have shown that isolated stable fibula fractures can be treated successfully even without sturdy external ankle support.27282934 On the basis of these findings we tested whether isolated fibular fractures identified as stable using an external rotation stress test11 could be treated by immobilisation for only three weeks—even using an orthosis that merely provides patients with some psychological support and comfort to enable immediate weightbearing. We conducted a pragmatic, multicentre, randomised, non-inferiority trial to compare the conventional strategy of immobilisation using a cast for six weeks with immobilisation for three weeks (using either a cast or an orthosis) for isolated stable Weber B type fibular fractures. We hypothesised that successful fracture healing of such fractures can be achieved safely after only three weeks of immobilisation. We conducted a randomised, parallel group, non-inferiority study to compare traditional immobilisation by cast for six weeks with immobilisation for three weeks using either a cast or an orthosis for isolated stable Weber B type ankle fractures at two trauma centres in Finland. The reporting of this study follows the CONSORT guidelines for non-inferiority trials.35 Supplementary appendix 1 shows the study protocol and statistical analysis plan. No changes were made to the study protocol after the trial started. All patients gave written informed consent. All skeletally mature patients (16 years or older) with an isolated Weber B type fibular fracture (fig 1) and congruent ankle mortise (medial clear space <4 mm and ≤1 mm wider than the superior clear space) in the primary radiographs (see supplementary appendix 1 figure S1) visiting the emergency departments of either of the two participating university hospitals, were assessed for study eligibility. To assess the stability of the fracture, the orthopaedic surgeon on-call carried out an external rotation stress test11 under fluoroscopy (see supplementary appendix 1 figure S2). The fracture was considered stable when the medial clear space was less than 5 mm under external rotation stress, as measured between the lateral border of the medial malleolus and the medial border of the talus at the level of the talar dome111213 (see supplementary appendix 1 figure S2). Radiographs were calibrated using a 30 mm disk, with measurements made to an accuracy of 1 mm. Other inclusion criteria were the ability to walk unaided before the current trauma and enrolment fewer than seven days after the injury. We excluded patients with previous ankle fracture or suspicion of a previous deltoid ligament injury (a history of ankle twisting injury requiring cast treatment), other important fracture in the affected ankle or foot area, current bilateral ankle fracture, concomitant tibial fracture, pathological fracture, diabetic or other neuropathy, inadequate cooperation, or permanent residence outside the catchment area of the two study hospitals. Patients were randomly allocated (1:1:1 ratio) to the six week cast, three week cast, or three week orthosis group using sealed and consecutively numbered, opaque envelopes. A biostatistician who was not involved in the clinical care of the patients prepared the envelopes using a computerised random number generator. Allocation was stratified by site and blocked within stratums using random permuted blocks (block size 6, 9, and 12). After consent had been obtained, the orthopaedic surgeon on-call individually randomised participants by opening the next available numbered envelope. These surgeons were not involved in further treatment of the participants. Blinding of participants was not possible because of the nature of the interventions. The unblinded participants self reported the primary outcomes, but the outcome assessors (trained study physiotherapists) of other study outcomes and doctors carrying out the follow-up visits were blinded to group allocation when possible. According to treatment group assignment, a trained plaster technician applied a standard below-the-knee cast (3M Scotchcast; St Paul, MN) for the three week or six week cast groups, or a commercially available, simple orthotic device (Dynacast/Ortho-Glass; BSN medical, Rutherford College, NC) for the three week orthosis group, to ensure correct fit and comfort. The cast was applied from the tuberosity of the tibia to the base of the toes and was lined and padded (see supplementary appendix 1 figure S5). The orthotic device was applied according to the manufacturers’ instructions, from the middle third of the tibia to the calcaneus (see supplementary appendix 1 figures S3 and S4). Participants received guidance from a physiotherapist on walking with crutches. Weightbearing was permitted in all three groups immediately after the application of the cast or orthosis. Participants received written and verbal instructions on to how to cope with the ankle fracture and support (cast and orthosis groups) and how to remove and reapply the support (orthosis group). Although we did not perform a formal registration of problems related to ill fitting supports, or compliance with the external supports (cast or orthosis), we asked participants with such issues to contact the study hospitals. If problems were encountered, a new cast was applied. Participants in the three week orthosis group were instructed to wear the brace as necessary or according to comfort. They could take off the orthosis when needed and move their ankle freely. The cast or orthotic device was removed at the three week follow-up visit. Those in the three week treatment groups (both orthosis or cast) were instructed to continue weightbearing as tolerated with no need for further bracing or support, whereas participants in the six week cast group received a new, below-the-knee cast. The primary outcome measure was the Olerud-Molander Ankle Score (OMAS; scale 0-100, with higher scores indicating better outcomes and fewer symptoms), a validated, condition specific, patient reported measure of ankle fracture symptoms.3637 OMAS is an ordinal scale, but with 21 classes (scale 0-100, at intervals of 5 points), it is close to numerical continuum and is handled as such in the statistical analysis. The primary time point was 52 weeks, as predefined in the trial registration. The primary outcome was also assessed at six and 12 weeks, but these data were only intended to illustrate the trajectory of the treatment responses. The secondary outcome measures were the Foot and Ankle Outcome Score (FAOS, five subscales from 0-100, with higher scores indicating better function),38 a 100 mm visual analogue scale for function and pain (range 0-100, with higher scores indicating more severe pain or dysfunction),39 the RAND 36-item health survey for health related quality of life (RAND-36, eight subscales from 0-100, with higher scores indicating better quality of life),40 range of motion (ROM) of the injured ankle measured using a goniometer4142 (see supplementary appendix 1), malunion (ankle joint incongruity) determined from radiographs (yes or no), and fracture union (assessed at 52 weeks). We considered fracture union to be complete when the fracture line had disappeared, and non-union present when the fracture line was visible. Two experienced orthopaedic surgeons with no access to clinical data or patient reports analysed the radiographs. Except for fracture union, we assessed all secondary outcomes (FAOS, visual analogue scale, and RAND-36, range of motion, ankle joint congruity) at six, 12, and 52 weeks, but similarly to OMAS, the data of the interim data points were only intended to illustrate the trajectory of the treatment responses. An expert panel consisting of three experienced academic orthopaedic trauma surgeons and a bilinguist (English and Finnish) translated the OMAS and the FAOS questionnaires. Expected complications or harms related to study treatments, which included loss of congruity of the ankle joint, venous thromboembolism, nerve compression, and fracture non-union, were recorded as adverse events. In addition, we recorded unexpected adverse events. At each follow-up visit we queried about harms, and participants were asked to describe any negative effects of the trial treatment. The congruity of the ankle joint was confirmed with radiography. Two experienced orthopaedic surgeons conducted additional ad hoc consultations when requested by participants. Clinical follow-up visits were scheduled at 3, 6, 12, and 52 weeks after randomisation at the orthopaedic outpatient clinic of the study hospitals. These visits included clinical examination and radiography (mortise and lateral projections) of the injured ankle to assess ankle joint congruity. Immediately before the follow-up visits at 6, 12, and 52 weeks, the participants independently completed questionnaires assessing ankle functional outcome, pain, and quality of life. Sample size calculations were performed assuming a two arm study (six week cast versus three week cast or versus three week orthotic device). In our previous study3 on non-operative treatment of stable ankle fractures with the same primary outcome (OMAS), the mean OMAS score was 88 (SD 20), and our sample size calculation was based on this (non-inferiority margin). During the design of the present trial, no estimate for minimal clinically relevant change existed for OMAS. In the absence of better evidence, we organised a focus group discussion among experts to define the appropriate estimate for non-inferiority margin. The panel reached a consensus that a 10% difference in 0-100 OMAS scale would not be clinically significant, which was then used to derive our non-inferiority margin (10% equals 8.8 points on the OMAS scale, Cohen’s d=0.215, indicating a small effect size). With α=0.05, power 80% (1−β=0.8), a non-inferiority margin of 10% (8.8 points), and the estimated true difference between the novel treatments compared with conventional treatment equals 1.0 point in favour of the new treatments, with a dropout rate of 20%, the calculations resulted in 82 patients in each group (total n=246) (see trial protocol, supplementary appendix 1). Given that some preliminary evidence suggested that more functional ankle fracture treatment could result in slightly superior outcomes to traditional six week treatment with a cast,2429 we assumed that the possible benefit of the three week treatments (cast or orthosis) equals one OMAS point. The trial was primarily designed to ascertain whether immobilisation by cast or orthosis for three weeks is non-inferior to cast immobilisation for six weeks, 52 weeks after the injury, with the primary outcome, the OMAS. Only the two primary analyses, six week cast versus three week cast and six week cast versus three week orthosis, were used to assess non-inferiority and there was no hierarchy between these two analyses. 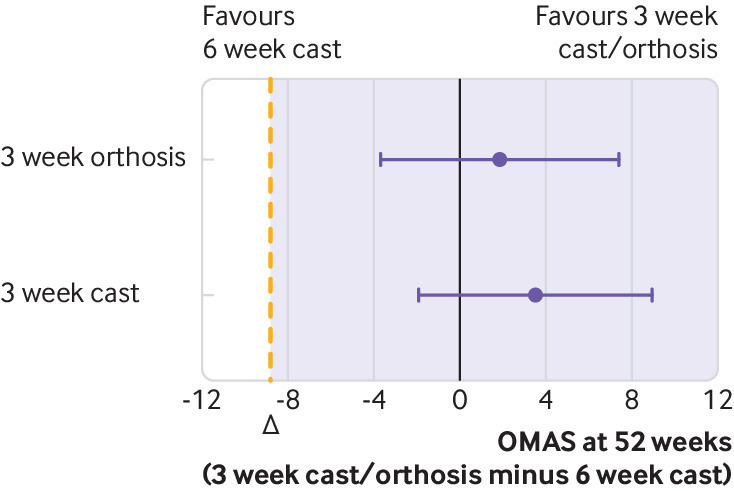 For the primary time point, non-inferiority of the three week cast and three week orthosis to six week cast could be claimed if the lower limit of the confidence interval (for differences in means in OMAS) was greater than −8.8 in either of the two primary comparisons. According to the CONSORT statement for non-inferiority and equivalence trials,35 secondary outcomes can be managed using either a superiority or an equivalence framework. In our trial, all secondary outcomes were assessed with a superiority hypothesis, but as the trial was not powered for these comparisons, we merely considered them to be hypothesis generating. Analyses were primarily conducted according to the intention-to-treat principle. In the intention-to-treat analyses, the participants were included as randomised. In addition, we carried out per protocol analyses to safeguard against the risk of falsely claiming non-inferiority.43 Summary statistics are given as means (with standard deviations) for continuous variables and as frequencies (with percentages) for categorical variables. For all continuous variables (both primary and secondary outcomes), we used a repeated measures mixed model analysis of variance with time, group, and time×group as fixed effects and patient as a random effect (repeated measurements at 6, 12, and 52 weeks) with a two sided 5% level of significance. The covariance structure was chosen according to Akaike’s Information Criterion, and we used the Kenward-Roger method to calculate the degrees of freedom.44 As the repeated measures mixed model allows the analysis of unbalanced datasets without imputation, we analysed all available data; the full analysis set. We report the between group differences for all continuous outcomes, at 52 weeks, with 95% confidence intervals derived from the repeated measures mixed model. In addition, we provide data from the six week and 12 week trajectory time points for the primary outcome. The categorical variables—the occurrence of treatment related adverse events and non-union—were contrasted with Fisher’s exact test and Wilson’s estimate for the confidence interval of the absolute risk difference. The statistical programs SPSS (2010 release, IBM SPSS Statistics for Windows; version 22.0, IBM, Armonk, NY) and SAS (version 9.3, SAS Institute, Cary, NC) were used for analyses. No patients were involved in the design process of this study, setting the research question, or the outcome measures nor were they involved in the analysis, interpretation, and writing of the results. Our findings from the trial will be shared with all participants, who will be provided with a lay abstract of our study and access to the full manuscript. Recruitment took place between 22 December 2012 and 6 June 2015. Final (52 week) follow-up assessments were completed on 6 June 2016. A total of 560 patients were assessed for eligibility: 272 were eligible and 247 consented to randomisation. 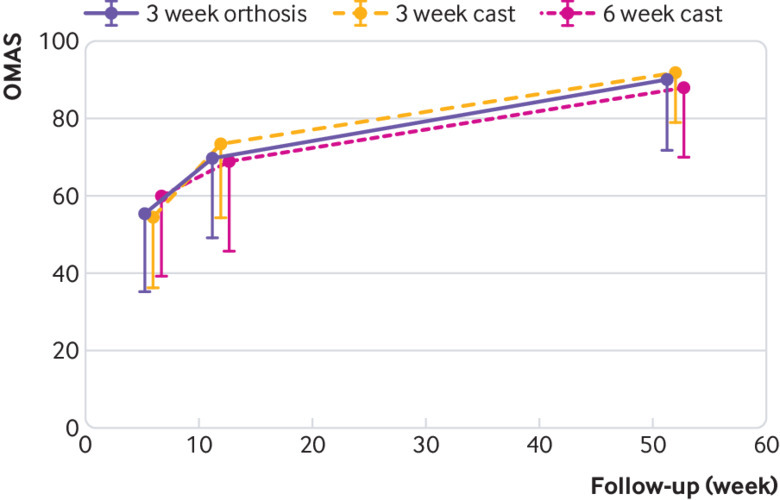 Of these 247 patients, 84 were randomised to the six week cast group, 83 to the three week cast group, and 80 to the three week orthosis group (fig 2). The main reason for exclusion was unstable ankle fracture diagnosed in the external rotation test (n=198). Of the 247 participants randomised, 244 (99%) were followed-up at three weeks, 241 (98%) at six weeks, 221 (89%) at 12 weeks, and 212 (86%) at 52 weeks. One patient from the three week cast group died for a reason unrelated to ankle fracture, about three months from randomisation. Table 1 shows the baseline characteristics of the three study groups. The average age of participants was 45 years, and 125 (51%) were men. Protocol violations occurred only in the six week cast group, with six participants declining to continue cast treatment beyond the three week clinical appointment. Three of these participants consented to wearing a removable orthotic device for the subsequent three weeks, and the remaining three participants refused to use any ankle support. We included these six participants in the six week cast group in the intention-to-treat analysis. In the primary intention-to-treat analyses, the between group difference in the three week cast versus six week cast group was 3.6 points (95% confidence interval −1.9 to 9.1; P=0.20), and for the three week orthosis versus six week cast group was 1.7 points (−4.0 to 7.3; P=0.56). These findings are consistent with non-inferiority, as the lower bounds of the two sided 95% confidence intervals for the differences between means in OMAS did not include the predefined non-inferiority margin of —8.8 points (fig 3). At this 52 weeks follow-up time point, the mean OMAS of the three study groups was 87.6 points (SD 18.3) in the six week cast group, 91.7 points (SD 12.9) in the three week cast group, and 89.8 points (SD 18.4) in the three week orthosis group. Per protocol analysis confirmed the findings of these intention-to-treat analyses (see supplementary appendix 2 table S3). The only statistically significant between group difference in the OMAS was a 7.2 point benefit of the three week cast over the six week cast (mean difference, 95% confidence interval 0.2 to 14.1, P=0.04) at 12 weeks (fig 4 and supplementary appendix 2, tables S2 and S3). Tables S4-S13 of the supplementary appendix 2 present the data on all secondary outcomes. At the primary time point (52 weeks), the only statistically significant between group difference in the secondary outcomes was a slightly improved ankle plantar flexion (mean difference 3.0, 95% confidence interval 0.2 to 5.8, P=0.04) of those treated with the orthosis for three weeks versus those treated with a cast for six weeks. Standard ankle radiographs were missing for 13 of 84 participants (15%) in the six week cast group, 11 of 83 (13%) in the three week cast group, and 14 of 80 (17%) in the orthosis group at 52 weeks. All ankle joints remained congruent throughout follow-up, and accordingly, surgery was not needed in any participant to restore a widened ankle mortise. However, two cases of non-union were found among the participants, both in the three week cast group. One of these participants gradually experienced symptoms, requiring surgery at 11 months after injury, whereas the other participant scored 95/100 on the OMAS at the 52 week follow-up and reported no symptoms, and therefore no additional treatment was warranted. The overall rate of fracture union among the three treatment groups was high (99.2%) (see supplementary appendix 2 table S7). No significant between group differences were found in this outcome, with the 95% confidence intervals for fracture non-union ranging from −2.7% to 9.6% for the three week cast versus six week cast group (P=0.50) and from −5.1% to 5.5% for the three week orthosis versus six week cast group (P value not calculable). A symptomatic deep vein thrombosis was diagnosed in eight patients (table 2 and supplementary appendix 2 table S14); five in the six week cast group, three in the three week cast group, and none in the orthosis group. The between group differences in the incidence of deep vein thrombosis (with 95% confidence intervals) ranged from −10.0 to 5.0 (P=0.72) for the three week cast versus six week cast group and from −13.2 to −0.3 (P=0.06) for the three week orthosis versus six week cast group. Apart from this latter, borderline statistically significant difference, no other significant between group differences were observed in the incidence of harms (table 2). In adults with a stable Weber B type fibula fracture, a strategy of immobilising the injured ankle for only three weeks in either a traditional cast or a simple orthosis resulted in ankle function and fracture healing non-inferior to that of conventional immobilisation for six weeks in a cast, without an increased risk of complications. As our trial was a non-inferiority trial, the rationale was not to primarily show that shorter immobilisation results in superior effectiveness outcomes, but rather to show that outcomes would be sufficiently close to that of conventional treatment with no excess harms. If proved, it is intuitive that patients would choose the shorter or the more convenient treatment strategy. Such contention is supported by a recent study from the United Kingdom showing that when patients with a stable ankle fracture were counselled about different options for conservative management and then encouraged to make an informed decision on which method of treatment they would like to pursue, the majority opted not to have a cast.46 In this context, no single protocol violation occurred in the three week treatment groups, whereas six (7%) participants in the six week cast group refused to continue the cast treatment beyond the three week follow-up appointment. Our study is not the first attempt to streamline the non-operative treatment of ankle fractures.242527282930464748 In fact, on the basis of evidence from biomechanical studies suggesting that early mechanical stimuli can enhance fracture healing,313233 a few attempts of treating isolated fibula fractures without any sturdy external ankle support had been carried out.272829 However, possibly due to absence of high quality evidence on the effectiveness and safety of more simple non-operative treatment strategies, the current tenet of six weeks of cast immobilisation coupled with a series of follow-up radiographs—even weekly48—still remains the ideal treatment of stable Weber B type fractures.819202223 This is based primarily on bioplausibility—experimental studies showing that it takes six weeks for any fracture to reach a sufficient strength to resist weightbearing induced strains49—and evidence from clinical trials showing satisfactory outcomes in patients with minimally or non-displaced Weber B type fibula fractures.16171819 It thus seems that although most Weber B type fibula fractures are stable and do not require plaster casting to achieve fracture union in a good position, orthopaedic surgeons value aversion of potential fracture displacement over the risks of prolonged immobilisation, including stiffness, skin damage, and thromboembolism. Traditionally, the assessment of the stability of the ankle mortise in patients with an isolated fibula fracture has relied on plain radiography and consensus based indicators for instability: fracture gap more than 2 mm, particularly when complemented with “red flag” clinical findings on the medial side of the ankle (tenderness, swelling, haematoma).1617182427282930 Occasional cases of treatment failures—widening of the ankle mortise—has been associated with this treatment strategy.161828 In our trial, we used external rotation stress testing, a method gaining popularity,67891112131415 to confirm the stability of the ankle mortise immediately after the injury. Given that not a single loss of congruence of the ankle mortise was observed over the course of our 52 week follow-up despite allowing participants to weightbear as tolerated immediately after injury and enrolling more “clinically severe” injury patterns than most previous trials1617182427282930 (table 1), the strategy proved successful. As the rates of fracture union ranged from 97% to 100% in all three groups at the primary 52 week time point, it seems highly unlikely that a longer follow-up time would materially change this finding. Consequently, our findings highlight the usefulness of implementing external rotation stress testing in the initial assessment of patients with ankle fractures and they also support the findings of previous studies35051 questioning the need for repetitive, routine radiography in the follow-up of these fractures once the stability of the ankle mortise has been confirmed initially. The appropriateness of the chosen non-inferiority margin is a critical methodological issue regarding the validity of any non-inferiority trial.35 Although no valid evidence existed on this problem while we were designing our trial, a recent study reported that the smallest real difference for the OMAS score is 12 points,37 which is clearly higher than the 8.8 point we set as our non-inferiority margin. Our follow-up rates (>95% at three and six weeks and >85% at 12 and 52 weeks) proved similar to the follow-up rates reported in two recent high quality trials on the management of ankle fractures.2652 We believe the results of this trial are generalisable to most patients with isolated, stable Weber B type ankle fractures, as both study hospitals were virtually the only hospitals treating ankle fractures within each catchment area. Some limitations warrant discussion. One can question the chosen study design of using the six week cast group as a comparator for both the three week cast and the three week orthosis groups without correcting for multiple testing. Controversy exists about the necessity of multiplicity correction, particularly with respect to non-inferiority trials5354—as also reflected by considerable variation in contemporary practices.54 We deemed that no correction for multiplicity (adjustment of significance) was necessary. In retrospect, it would have been more optimal to choose secondary outcomes that are clearly complementary to our primary outcome, assessing qualities that the new treatment is expected to offer benefits on, such as lower cost or greater ease of use. However, we believed that the advantages the new treatments offer are so obvious (cutting the immobilisation period to half) that they justify the new treatments if non-inferiority was proved. It can also be argued that owing to the non-inferiority design, protocol violations in the six week cast treatment group (n=6) skew our intention-to-treat analyses. However, the findings of the intention-to-treat analyses were confirmed in the per protocol analyses (see supplementary appendix 2, tables S3 and S9-13). The generalisability of our findings might be questioned, as external rotation stress testing is not universally used to confirm the ankle mortise stability. Although true, we feel that our findings make a strong case for wider adoption of external rotation stress testing in this setting. Similarly, the two cases of fracture non-union might raise concerns that the three week immobilisation does not provide sufficient stability or allows harmful micromotion within the fracture line. However, both non-unions took place in the three week cast group rather than in the less rigid orthosis group. Moreover, if the non-unions were indeed attributable to instability, they should have been hypertrophic, but they were atrophic. This finding rather suggests lack of biology or vascularity as the root cause. Given the low overall incidence of non-unions and their counterintuitive occurrence in the more rigid of the two three week immobilisation groups, we are inclined to think that the two cases represent a random phenomenon rather than being attributable to inadequate immobilisation. Finally, an argument can be made that all fracture trials should systematically document potential risk factors for complications with fracture healing (eg, body mass index, diabetes, tobacco consumption, and use of non-steroidal anti-inflammatory drugs). However, although factors such tobacco consumption, body mass index, and alcohol intake might affect how patients are treated by hospital staff, selection and confounding bias represent systematic differences that are prevented by successful randomisation and concealed allocation because all differences between the randomised groups must then be random. Although our three treatment groups showed no noticeable differences in baseline characteristics (table 1), we also carried out adjusted analyses to test that our results were not confounded by any residual baseline imbalances (see supplementary appendix 2, tables S15 A-F). The results of these sensitivity analyses were similar to the unadjusted analyses. The use of a functional orthosis has been associated with a reduced incidence of symptomatic deep vein thrombosis compared with cast treatment in patients with ankle fractures,245657 prompting assertions that more functional or shorter periods of immobilisation could have a preventive effect on thromboembolic complications in these patients.2324 Our findings of reduced incidence of deep vein thromboses (table 2) could be interpreted as supportive of such hypothesis. However, all these studies, including our trial, lack the required power for definite conclusions. Considering the reported incidence of symptomatic venous thromboembolism in patients with fractures below the knee in recent high quality studies (0.6% to 1.9%),585960 a trial of between 600 to 1000 patients would be needed to definitely address the potential effect of any intervention on incidence of deep vein thrombosis or pulmonary embolism in this context. 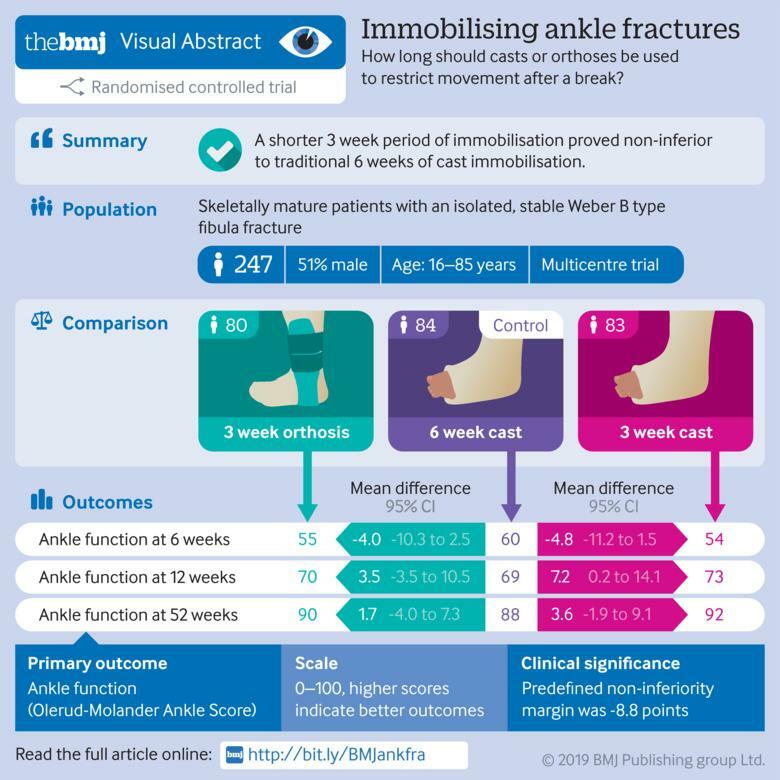 A shorter, three week period of immobilisation, either by cast or a simple orthosis, proved non-inferior to traditional six weeks of cast immobilisation for patients with stable, isolated Weber B type fibula fractures. We thank the participants for their time and commitment to our study, on-call surgeons (responsible for screening process, stability assessment, patient enrolment and randomisation, informing patients), emergency department staff, outpatient clinic staff, radiographic staff, and hospital physiotherapists; Hannu-Ville Leskelä, Ilari Pajamäki, Niina Siira, Seija Rautiainen, and Tuula Rauma for their practical and clinical assistance; Jonas Ranstam, Martin Englund, and Aleksandra Turkiewich (Lund University), and Volkert Siersma (University of Copenhagen) for their help in responding to reviewer comments; and Ian Harris (University of New South Wales, Sydney) and Clare Ardern (Linköping University) for critical review of the manuscript. Contributors: TK searched the literature; participated in the study design; collected, analysed, and interpreted the data; and wrote the manuscript. HH searched the literature; designed data collection tools; collected, analysed, and interpreted the data; and participated in writing the manuscript. TF designed the study, analysed and interpreted the data, and wrote the manuscript. PO participated in the study design and writing the manuscript, wrote the statistical analysis plan, and analysed and interpreted the data. He was study biostatistician. SN collected the data and participated in data interpretation and writing the manuscript. HJL participated in the literature search, study design, data interpretation, and writing the manuscript. TJ participated in the analysis and interpretation of the data and revision of the article. HP searched the literature; designed data collection tools and the study; collected, analysed, and interpreted the data; and participated in writing the manuscript. All authors contributed to final interpretation of the data and contributed to and approved the final draft of the manuscript. HP and HH obtained funding. TK is guarantor. On-call surgeons at the Oulu and Tampere University recruited most of the patients, assisted by TK, SN, HP, and HH. Orthopaedic residents at the Oulu and Tampere University Hospitals followed-up the patients. The corresponding author attests that all listed authors meet authorship criteria and that no others meeting the criteria have been omitted. Funding: This study was supported by state funding for university level health research (Oulu University Hospital; grant No EVO-VY 244770/24780 and Tampere University Hospital; grant Nos 9R006 and R9031). The funding sources had no role in study design, data collection, data analysis, data interpretation, or the writing of this report; and in the decision to submit the manuscript for publication. The corresponding author had full access to all the data in the study and had final responsibility for the decision to submit for publication. Competing interests: All authors have completed the ICMJE uniform disclosure form at www.icmje.org/coi_disclosure.pdf and declare: TJ reports an honorarium for a lecture on osteoporosis from AMGEN (donated to AllTrials campaign). Other authors declare no support from any organisation for the submitted work; no financial relationships with any organisations that might have an interest in the submitted work in the previous three years; no other relationships or activities that could appear to have influenced the submitted work. Ethical approval: The study was conducted in accordance with the Declaration of Helsinki. This study was approved by regional ethics committees of Northern Ostrobothania Hospital District (EC 25/2012) and Pirkanmaa Hospital District (R12142). Data sharing: Trial data are not publicly available owing to data privacy, but access to the anonymised dataset can be obtained from the corresponding author on reasonable request. Transparency: The lead author, guarantor (TK) affirms that the manuscript is an honest, accurate, and transparent account of the study being reported; that no important aspects of the study have been omitted; and that any discrepancies from the study as planned (and, if relevant, registered) have been explained.
. Die Verletzungen des oberen Sprunggelenkes. Aktuelle Probleme in der Chirurgie.2nd ed. Verlag Hans Ruber, 1972.
. Fractures of the ankle. In: Schatzker J, Tile M, eds. The Rationale of Operative Fracture Management.3rd ed. Springer, 2005: 551-90doi:10.1007/3-540-27708-0_22.
. Ankle fractures. In: Bucholz RW, Heckman JD, Court-Brown CM, eds. Rockwood and Green’s Fractures in Adults.7th ed. Wolters Kluwer Health/Lippincott Williams & Wilkins, 2010: 1975-2021.
. Malleolar fractures. In: Bhandari M, ed. Evidence-Based Orthopedics.1st ed. Blackwell Publishing, 2012: 561-6. Aalto A, Aro A, Teperi J. RAND 36 terveyteen liittyvän elämänlaadun mittarina (RAND 36 as a measure of quality of life. [In Finnish]). Saarijärvi, Finland: Gummerus Kirjapaino Oy 1999.
. Measurement of Joint Motion: A Guide to Goniometry.3rd ed. FA Davis, 2003.
. Applied Mixed Models in Medicine.2nd ed. John Wiley, 2006doi:10.1002/0470023589. Julious SA. Sample Size Calculations for Non-inferiority Clinical Trials with Normal Data. Sample Sizes for Clinical Trials. 1st ed. Chapman and Hall/CRC, 2010: 95-106.